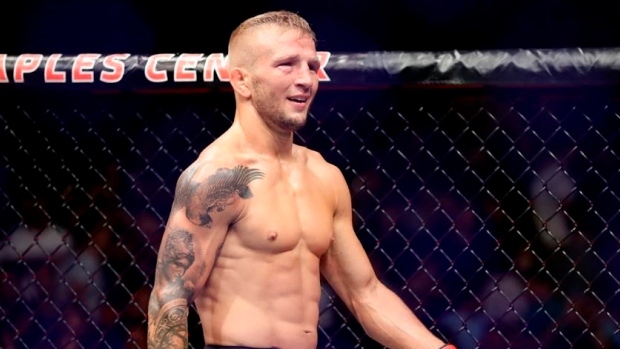 Former two-time UFC bantamweight champion T.J. Dillashaw has been suspended for two years for testing positive for a banned substance by the United States Anti-Doping Agency (USADA). Dillashaw, 33, tested posted for erythropoietin (EPO) prior to a January 19 fight against Henry Cejudo for the flyweight title that Cejudo defended with a first-round TKO. The native of Sonora, CA announced the positive test on his Instagram page on March 20 and voluntarily relinquished his title. Dillashaw is not contesting the suspension. We all know the pressures to win at all levels of all sport are real and intense," USADA CEO Travis Tygart said in a statement released to ESPN's Brett Okamoto. "It is exactly why strong anti-doping efforts are necessary to protect clean athletes' rights, health and safety and to ensure that those who do succumb to these pressures and decide to break the rules will be held accountable in a real and meaningful way, as in this case." Jeff Novitzky, the UFC vice president of athlete health and performance, believes that category of drug must be taken willingly. "I'm quite familiar with EPO from my days investigating professional cycling teams," Novitzky said. "It's a very effective substance. It's not a substance you find in contaminated supplements, it's injectable only. You have to know what you're doing when it enters your system. On a scale of seriousness in anti-doping, it's up near the top." Dillashaw becomes the second fighter suspended for EPO since UFC began its partnership with USADA in 2015. Lightweight Gleison Tibau was suspended for two years in 2016.